It was the final day for Paul Stevens. He has been fishing for six straight days and still wanted to score a blue or black marlin. Pete Santini promised he would do his best and the second marlin of the day was a big blue marlin estimated at over 400lbs. How Santini does this I will never know. We never got a picture of this fish as we pulled the lure out during the wiring process (but everyone got a good look at it). I have been fishing for 10 days now and Pete has already caught three big blue marlin. There are five other boats here and no one else has caught even one. This is certainly due to lure selection and the layout of of the spread. Pete has been doing nothing but pulling big lures here for several years. Many of the other boats focus more on trolling ballyhoo which can at times produce more striped marlin, but it seems this is not the best way to target the blue and black marlin. Nearly all of the strikes are on big lures fished very close to the boat. We almost never see these fish (blues and blacks) coming. We almost always get a good look at the striped marlin before they strike. Blue and black marlin in the Galapagos are incredibly aggressive and are looking for a big easy meal. They focus on the biggest object in the water (the boat) and then go from there. They do not play with a lure, they just come up and smash it. On the way back in, we put Melissa Stevens and Billy Ronk on a popping plug bite. 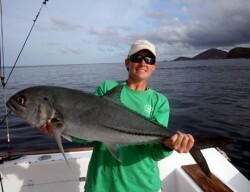 They both scored some huge bigeye jacks (bigeye trevally) and Billy nailed a big yellowfin (70lbs). At one point I grabbed a rod and threw to the edge of a bait ball and got hammered by a monster yellowfin that was well over 150lbs that ripped the middle treble right off the plug. I was lazy and grabbed a plug right out the the package and payed the price. This is just one more lesson that I have learned on this trip. 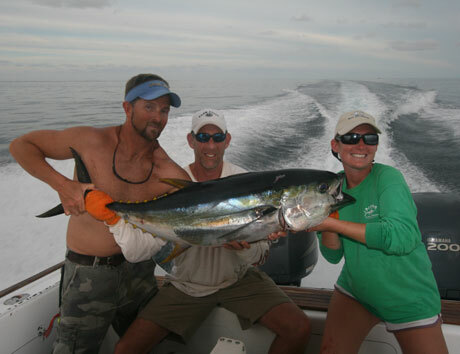 Click here for our recommended tackle for tuna plugging. I have yet to find any plug manufacturer that provides the hooks needed to handle these big fish. The hooks that come on the plugs are more than adequate for nearly all uses. However, when it comes to big tuna both the split rings and the hooks must be upgraded. We are now using only 3/0 and 4/0 – 4x strong Mustad trebles. These are simply the best (and only) choice. When throwing poppers we ae using 80lb Spiderwire Ultracast on a spinning outfit rated for the same (Penn TRQS7 and Penn Carnage rod). This means that we can use loads of drag pressure. There is one big problem with this; the initial strike can be so violent and happen so close the boat that the lures and connections can fail before the drag can react. We have dealt with this by using a much lower drag setting and then bumping up the drag once the fish is hooked. However, we need to remember to loosen the drag again after the fish has been landed. This was one of many big yellowfin tuna that were taken on poppers as part of our field testing for the new Penn Carnage rods matched with the Penn TRQS7. Angler Billy Ronk applies incredibly pressure (at least 30lbs of drag and possibly as much as 40lbs) to show off the toughness of the rod and reel combo. Earlier in the week, a comparable rod from another manufacturer broke under significantly less pressure. The proves that this outfit can easily handle the biggest yellowfin tuna.